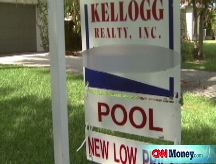 Realtors say sales fell 5.3% in January, believing would-be buyers delayed purchases due to stimulus talk. Housing hit harder in '09? NEW YORK (CNNMoney.com) -- Sales of existing homes fell in January to their lowest levels in nearly 12 years, with a real estate group saying buyers delayed purchases in anticipation of government programs to boost the housing market. The National Association of Realtors said Wednesday that existing home sales dropped 5.3% last month, to a seasonally adjusted annual rate of 4.49 million units from a rate of 4.74 million in December. January sales were the lowest since July 1997, and were far below the consensus estimate of 4.79 million units, according to a survey of economists compiled by Briefing.com. The decline comes as some buyers forgo purchases in anticipation of government stimulus efforts aimed at boosting home ownership, according to the NAR. "Given so much stimulus package discussion in January, some would-be buyers simply sat out for clarity and certainty on the nature of housing stimulus," said Lawrence Yun, the NAR's chief economist, in a statement. But sales could pick up in the coming months as prices continue to fall and interest rates ease, Yun said. The national median existing-home price was $170,300 in January, down nearly 15% from last year when the median price was $199,800. Despite the decline in sales, the number of homes on the market decreased to 3.6 million existing homes from 3.68 million in December. At the current sales rate, it will take an estimated 9.6 months to sell down 3.6 million homes, the report said. "The drop in total inventory is an encouraging sign because the number of homes on the market has declined steadily since peaking in July 2008, and inventory is at the lowest level in two years," Yun said. In January 2008, there were 3.54 million homes for sale. Existing home sales unexpectedly rose in December as rock-bottom prices attracted some buyers in certain distressed markets. That led some analysts to speculate that the housing market was nearing its bottom after months of weak sales and falling prices. But January's figures suggested otherwise, notes Weiss Research analyst Mike Larson. "Another false dawn? That's what December looks like, considering the dismal performance of the existing home market last month," Larson wrote in a research report. While tight credit and waning consumer confidence continue to depress home sales, the biggest challenge facing the housing market is unemployment, Larson said. "If Americans are worried they won't have a job next month, next quarter, or next year, you've got a real problem," he said. "It doesn't matter if mortgage rates are 3% or 8%. People just aren't going to buy many houses."